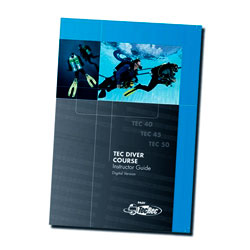 The Tec Diver Course Instructor Guide is now available as a digital product, ready to be loaded directly onto your laptop, enabling travelling instructors to offer the courses wherever they are. Besides the course guides, the CD ROM also includes a PDF of the Appendix, with course forms, applications answer keys, answer sheets, handouts and other support materials used during the course. TecRec Instructors can now simply contact their Product Consultant for details on how to purchase this item.